Big time.....Big fish.....Big time guides. You know where going back. Go see these guys you'll be glad you did. They know their business and they make it fun! I would recommend this guide service to anyone. Best guide trip I have ever had thanks to Cory Vinson. Best trip I have ever had. Plan to do it again next year if not sooner. Great guide and great service! Absolutely excellent. Worth every penny! Good time, good people, fishing was excellent! Collin did a good job! Tried very hard! Collin did a good job! Good People! Always fun and Cory will find the fish! Mucho fun.Caught the biggest catfish I evercaught 18 lbs. and a 13 lb striper. Guaranteed Guide Service was started on Lake Whitney in 1997. After a devastating fish kill in 2004, caused by Golden Algae, we moved our operations to Richland Chambers Reservoir. We came to Richland Chambers with one guide boat, and a lifetime of striper fishing knowledge. As the years have passed we have grown to a 4 boat operation, fishing both Lake Whitney and Richland Chambers Reservoir. Both lakes are located just 90 minutes south of the DFW Metroplex. The reason for our success is not solely predicated on our ability to fish, rather in the way that we treat folks. We are true “people” people and realize that you have hired us to provide you a FUN day on the water catching fish. 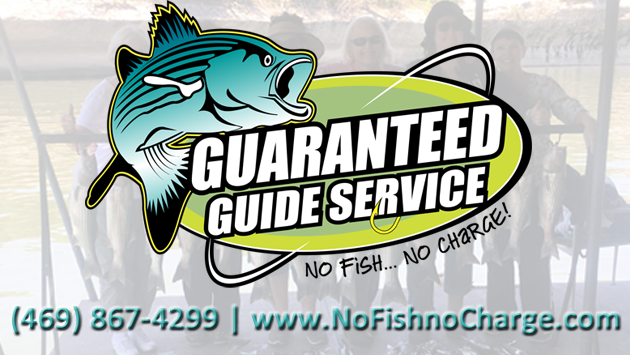 So call today and become a part of the Guaranteed Guide Service Family and lets go have some fun on the water! All fishing trips are based on a time limit, not a limit of fish. We at Guaranteed Guide Service feel that when you hire us for a half day of fishing, you deserve at least 4 ½ - 5 hours on the water. If you hire us for a full day, we provide you with 8-10 hours on the water. The majority of our competitors provide their customers with a four hour half day trip or a limit of their target fish…whichever comes first. We do not see the value in a guide service putting their customers on a big school of small fish in order to limit out fast and have the customers back on the dock within an hour or so of the trip’s inception. If we limit out early on our target fish we change species and keep on fishing. Now that’s value! We are here to provide you with a “fun” day on the water. We realize that many of our customers may only fish once or twice a year and that their skill level is not at the level of a professional angler, so never do we chastise someone for a missed fish, an errant cast or a backlashed reel. We are here to help you put fish in the boat and have a great time doing it. We fish out of 24’ custom built guide boats that provide you and your party with a very spacious, safe and dry fishing vessel. All of our boats are equipped with the latest electronics and fishing gear to make your trip a fish catching experience of a lifetime. Simply put “No Fish…No Charge!” We feel that you should catch fish on every outing with Guaranteed Guide Service. Some days are better than others but we put our customers on fish day in and day out. If we do get skunked, you don’t pay us a dime.